Dateline Bangkok: The Selfie Book! The Selfie Book! (subtitled Taking & Making The Best Selfies, Belfies, Photobombs, & More...), by Carrie Barclay and Malcolm Croft, is a brief guide to selfie culture. Full of lists, celebrities, and exclamation marks, it feels like a cross between BuzzFeed and Heat magazine. It has novelty value as the first compilation of famous selfies (posted on Instagram by Kim Kardashian et al. ), though the photos are mostly undated and overall it's nothing more than a stocking-filler book. 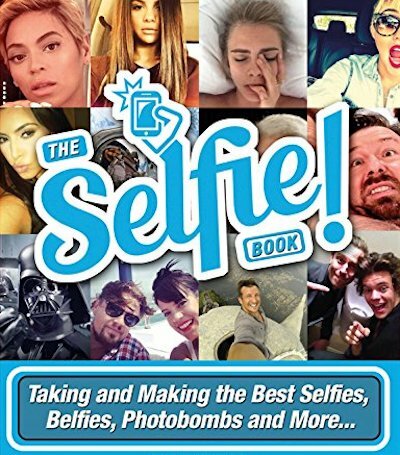 "Types of Selfie", the book's taxonomy chapter, shows how pervasive selfies and smartphones have become: there are 'celfies' (celebrity selfies), 'belfies' (bum selfies), 'welfies' (workout selfies), 'telfies' (toilet selfies), 'felfies' (farm animal selfies), 'sheepies' (sheep selfies), 'pelfies' (pet selfies), 'drelfies' (drunk selfies), and 'fullies' (full-body selfies). Examples of all of these are included, along with headline-grabbing selfies such as Bradley Cooper's group portrait ("The world's most popular selfie... retweeted more than two million times") from 2014.